Diego Rivera, The Marriage of the Artistic Expression of the North and of the South on this Continent (Pan American Unity), 1940. © Banco de Mexico Diego Rivera & Frieda Kahlo Museums Trust, Mexico D.F. / Artist Rights Society (ARS), New York. Image: courtesy City College of San Francisco. SAN FRANCISCO, CA (December 11, 2017) — The San Francisco Museum of Modern Art (SFMOMA) and the City College of San Francisco (CCSF) today announced plans to display Diego Rivera’s historic mural, Pan American Unity, as the cornerstone of a major exhibition of the artist’s work at SFMOMA in 2020. The mural — one of the most important works of public art in San Francisco — will be on view in the museum’s Roberts Family Gallery on the street level, part of the museum’s free, unticketed space. A comprehensive program of conservation, public education and CCSF student internships will accompany the exhibition of the work and will be announced in greater detail at a later date. Early funding for these initiatives has been provided in part by the Koret Foundation. Diego Rivera’s The Marriage of the Artistic Expression of the North and of the South on the Continent, more commonly known as Pan American Unity, was created in 1940 as part of the Art in Action program at the Golden Gate International Exposition (GGIE) on San Francisco’s Treasure Island, where local and international artists created works of painting, sculpture, weaving, stained glass, prints and engravings before an audience of fairgoers. Measuring 22 feet high and 74 feet wide (nearly 1,800 square feet) and comprised of ten fresco panels, the mural is the largest created by Rivera and his last made in the United States. As a result of a partnership between one of the GGIE’s commissioners and Rivera, from its inception the mural was slated for permanent display at what is now known as City College of San Francisco. Rich in symbolism and imagery from across the North American continent, including Mexico, the United States and Canada, Pan American Unity has been on view in the Diego Rivera Theater on the main campus of City College of San Francisco since 1961. 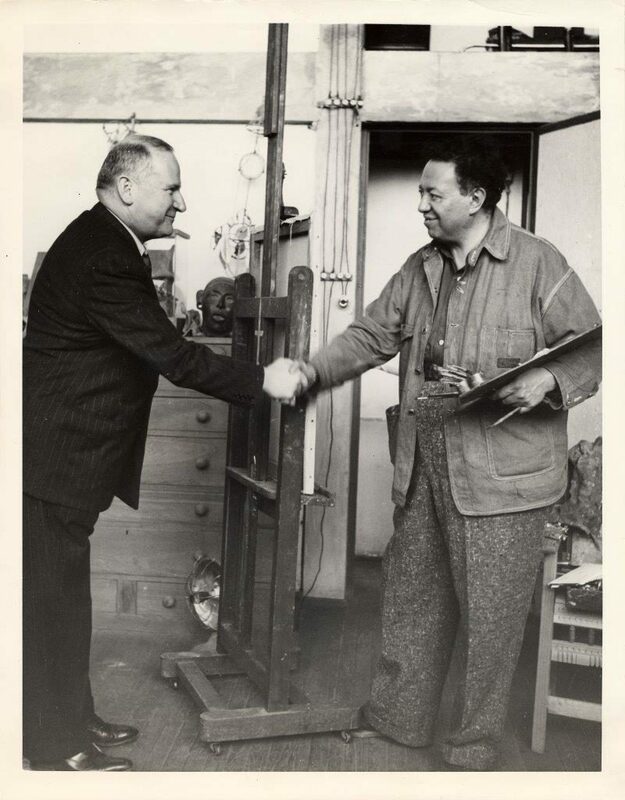 Diego Rivera shaking hands with Timothy Pflueger, 1940. Courtesy San Francisco History Center, San Francisco Public Library. At the invitation of noted architect Timothy Pflueger, Vice Chair, Fine Arts Committee, Diego Rivera came to San Francisco to participate in the Art in Action program in the Hall of Fine and Decorative Arts during the 1940 season of the Golden Gate International Exposition on Treasure Island. Fairgoers were invited to watch artists create work in a Pan Am Clipper airplane hangar converted into an artist studio and gallery. Rivera and his assistants began work in June 1940 and completed the mural in December, two months after the close of the Exposition. Over 30,000 visitors viewed the mural during a preview and a public viewing. Pflueger was at the same time working to build the campus of San Francisco Junior College (now City College of San Francisco). Together he and Rivera agreed that the mural would be permanently displayed at a new Grand Library on the college’s campus, where Rivera would work in view of the public to triple the size of the mural. However, due to the ban on non-essential construction during WWII and the unexpected death of Pflueger, the proposed Grand Library was never constructed. In addition, during the McCarthy era of the 1950s, controversy regarding Rivera’s communist politics further delayed installation of the fresco at the college. However, Milton Pflueger, Timothy Pflueger’s brother, proposed to the San Francisco School Board that the mural be installed in the foyer of the college’s new performing arts theater. He redesigned the lobby and installed the mural, making it accessible to the public in 1961. The building was renamed the Diego Rivera Theater in honor of the artist in 1993. At the conclusion of the planned SFMOMA Rivera exhibition, the mural will return to City College of San Francisco for permanent display. Using fresco techniques in the manner of Italian Renaissance painters, but updating its themes and reimagining its social function, Rivera created ten steel-framed panels allowing individual sections to be transported and relocated. Four panels on the lower row are discrete scenes, with the top five panels and the lower center panel forming a continuous view featuring one of Rivera’s most dynamic montage narratives. “My mural will picture the fusion between the great past of the Latin American lands, as it is deeply rooted in the soil, and the high mechanical developments of the United States,” described Rivera. Pan American Unity is a sweeping panorama of the Bay Area that merges with generalized reference to the pre-Conquest cities of the Valley of Mexico City (left side) and other scenes of Northern California (right side). Rivera’s imagery extends from ancient civilizations (Toltec, Aztec) to Bay Area architectural icons (the Golden Gate Bridge, 450 Sutter, 140 Montgomery St, Alcatraz). Rivera also incorporated topical events, as well as references to his previous murals and artworks. He used scenes from Hollywood movies such as The Great Dictator, Confessions of a Nazi Spy and All Quiet on the Western Front to attack the tyranny of the World War II Axis powers and subtly encourage the United States to join the war against Germany. The mural centers on a binational “deity” that combines the Aztec earth goddess Coatlicue with a modern machine. Around this symbol of ancient-modern/North-South, he depicts numerous notable contemporary and historical figures from across the continent and across time: inventors and their inventions (the 15th century Texcoco king Nezahualcóyotl as well as Samuel Morse, Robert Fulton, Henry Ford), political figures both heroic and demonic (Thomas Jefferson, Abraham Lincoln, Simón Bolívar, Miguel Hidalgo y Costilla, Joseph Stalin, Benito Mussolini and Adolf Hitler), artists and architects (Frida Kahlo, sculptors Mardonio Magana and Dudley Carter, architects Timothy Pflueger and Frank Lloyd Wright, and Rivera himself) and actors including Paulette Goddard, Charlie Chaplin and Edward G. Robinson. The mural also features a cross section of ancient and everyday people including athletes, scientists, artisans and Rivera’s assistants and visitors he met while at the GGIE.